If you’re younger than the age of 30, you probably never saw “El Tiante” pitch in the Major Leagues. That’s your loss. This guy was one of the most entertaining and skilled starting pitchers of his era. I remember his incredible 1968 season when he won 21 games for Cleveland. He was the ace of a very strong Indians’ pitching staff that led the AL with 23 shutouts, nine of which were thrown by Tiant. Cleveland won a total of 83 games that season and in over a quarter of those victories they shutout the opposition. Tiant’s career was then almost derailed by a rash of injuries and he actually was released by both the Twins and the Braves before he found his true home with the Red Sox. 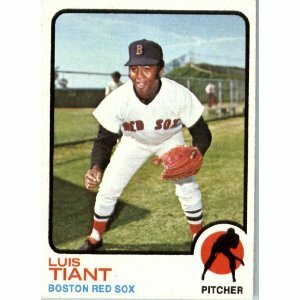 After an inauspicious start in Beantown, when Tiant went 1-7 in 1971, he won 121 games during the next seven years, including three 20-victory seasons and won the hearts of Red Sox fans in the process. It was Tiant’s two-hit shutout against the Blue Jays that got the Red Sox into the 1978 one-game playoff for the AL East crown. I still say if the Red Sox could have started this guy instead of Mike Torrez in that next game, Bucky Dent’s heroics never would have happened. Tiant pitched his very best at the the biggest of moments. In 1979, Tiant joined the Yankees as a free agent and pitched very well for a team torn apart first by management issues and then by the tragic death of their captain, Thurman Munson. Tiant won 13 games that season including his 49th and final career shutout. He fell to 8-9 the following year and the Yankees let him go. Tiant finished his 19-year big league career with a 229-172 record, a 3.30 ERA and 49 shutouts. He belongs in Cooperstown. He was was born on November 23, 1940, in Marianao, Cuba. He shares his birthday with recently departed Red Sox closer Jonathan Papalbon, who took his 219 career saves and deserted Red Sox Nation for a $50 million contract with the Phillies.